I made Yum Woon Sen yesterday for Ally over a nice indoor picnic we had in my room, of course on my signature carpet. It's a Thai glass noodle salad with meat and seafood that is deliciously light and refreshing. Nothing authnetic about my version, the real deal is fire in your mouth and sometimes I feel it's better to be able to actually taste the combination of ingredients together rather than allow the heat to overpower everything else. 300g of Squid, sliced into rings. 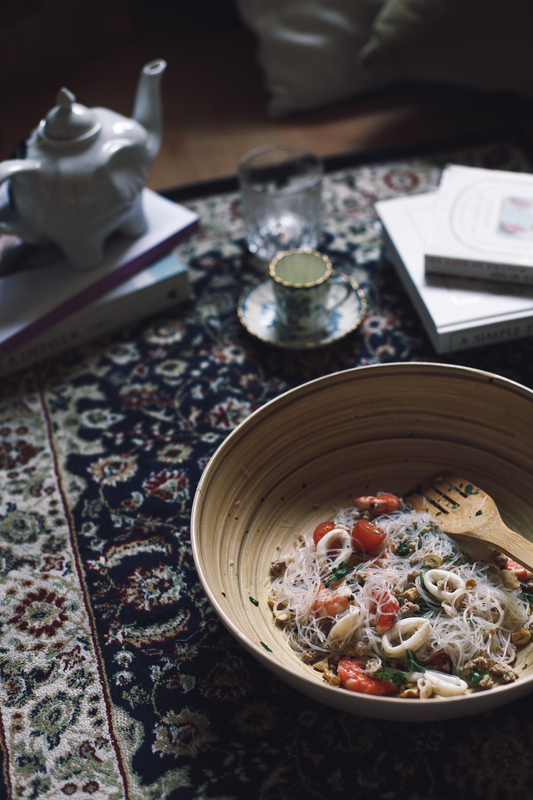 Set aside the glass noodles in a mixing bowl together with the cherry tomatoes and corriander. In some boiling water, cook the shrimps and squid, followed by the pork. Set aside to cool. To make the dressing- add the minced garlic to the fish sauce, sugar and lime juice in a box and mix. Add chillies if you like it spicy. Mix it according to your taste preferences. When the dressing is done, add the seafood and pork to the large mixing bowl with the noodles, tomatoes and corriander. Pour over the dressing and toss. Sprinkle the nuts over and serve.